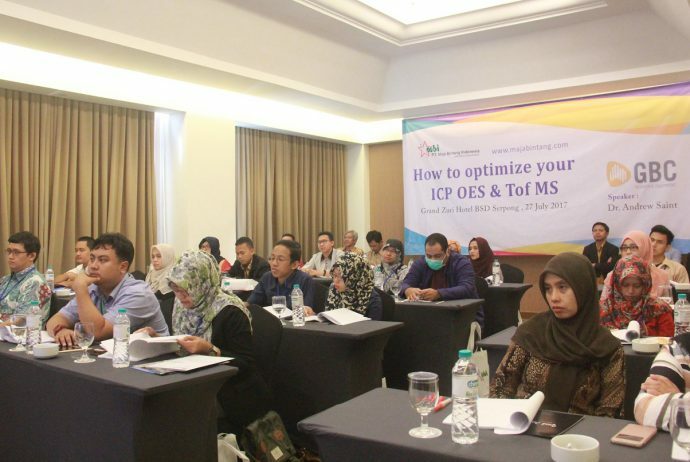 GBC has visited Asia, Europe, Latin America, Middle East and Africa conducting seminars with GBC distributors and end users alike, highlighting the benefits of GBC’s new simultaneous ICP-MS, the OptiMass 9600. The instrument includes an Octopole Collision Cell (OCC), which easily removes formation of interferences such as dimers and oxides. The OCC enhanced electronics allows control and improves ion transportation. The OptiMass 9600 acquires all masses simultaneously, analysis time is the same to analyse one mass or all masses. It performs 30,000 acquisitions each second. Each acquisition simultaneously measures every mass and isotope from mass 1 to 260 amu. This unique feature represents a major advancement in technology and differentiates the OptiMass 9600 from any other ICP Mass Spectrometer. Using the GBC Electro Thermal Vaporisation (ETV) accessory, a sample as small as 1 μL can be injected and all masses analysed. These samples can be oil, slurry or solids. The OptiMass 9600, with time-of-flight technology, takes ICP-MS to the next level.